FSCPL Volunteer Orientation - Don't Bury the Library! Mixed Use Building - No plans, drawings or descriptions were presented to the DLAC for the 44,000 sf space proposed for a library in a mixed-use building. The description of features in this document is speculative and undocumented. No Mixed Use Building - The DLAC did not discuss what would happen if the City Council does not approve its recommendation, nor has the City Council discussed such an eventuality. The three choices listed are speculative, not based on any definitive information from architects or City officials. Choice 1 - The Partial Remodel, Option A, in the DLAC recommendation, was added late in the process and no plans, drawings or descriptions were presented to the DLAC, nor included in the recommendation to the City Council. There has been no discussion of the limitations of this option, how additional upgrades and features would be funded. There is no documentation that annual maintenance costs for Option A would be higher than any other option. 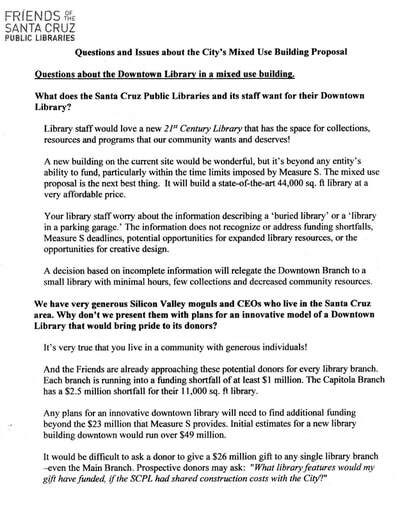 Choice 2 - There has been no discussion by the DLAC or City Council about a library half the size of the current downtown library. This was not presented by architects nor included in the DLAC recommendation. Choice 3 - There has been no discussion by the DLAC nor by the City Council about a private developer building a mixed-use building on the current site. This idea has had no public input or discussion. 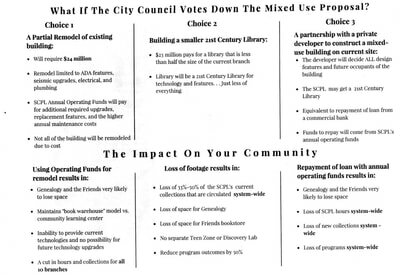 "Questions and Issues about the City's Mixed Use Building Proposal"
Page 1 - No information has been presented to the DLAC or the City Council to support the statement: "A decision based on incomplete information will relegate the Downtown Branch to a small library with minimal hours, few collections and decreased community service." 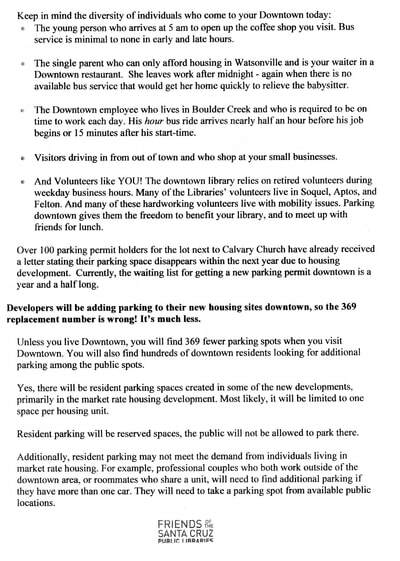 The present building does not meet this description, so any remodeling of the present building would improve it, not make it smaller, or reduce its hours and collections, or decrease existing community services. Page 2 - The "proposal" now under consideration is not the "City's proposal;" it is a recommendation by the DLAC. The City has yet to vote to approve the DLAC's recommendation, and/or present it's own proposal for the fate of the Downtown Branch building. 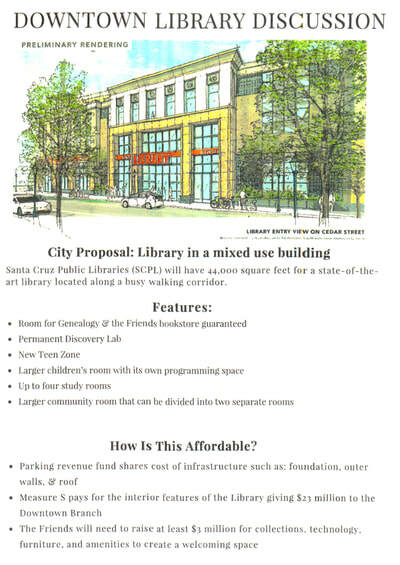 Measure S funds will go to the internal structural features of a 21st Century library, whether it be in the remodeled existing building or a new parking garage. The same infrastructure and features would be required for either eventuality. Providing a 21st Century Downtown Branch Library is not dependent on the construction of a parking garage, and a parking garage is not dependent on the library as a tenant. Regarding the current 8 year deadline for spending Measure S funds, Director Susan Nemitz stated at a DLAC meeting that the City could apply for an extension if required. 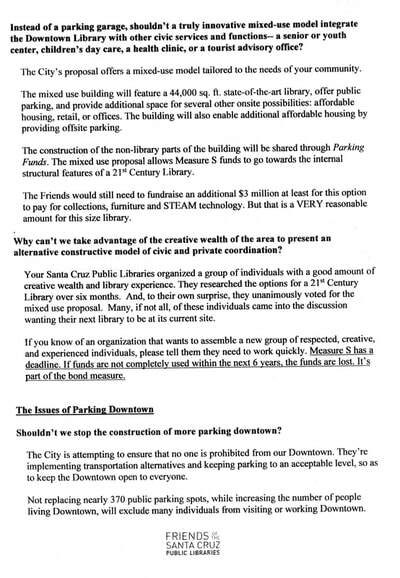 Page 3 - Downtown parking is not a concern of the Santa Cruz Public Libraries, and must not be used as an excuse to move the Downtown Branch Library into a newly constructed parking garage. 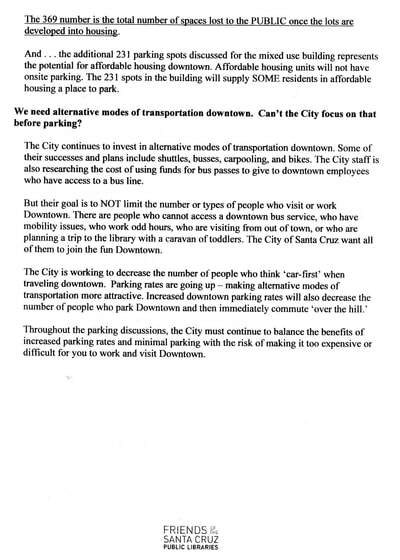 Page 4 - The Santa Cruz Public Library system is not responsible for City of Santa Cruz transportation planning. Planning, design and construction of a remodeled or new Downtown Branch Library building should be decoupled from City transportation planning and parking management.